Quarter sheet cake, Texas style! 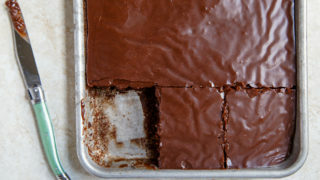 A small Texas chocolate sheet cake made in a quarter sheet pan! In the past 3 years, we’ve moved 3 times. I met and fell in love with my husband in California. We talked about moving closer to family on our first date. A little over a year later, we did. We moved outside Kansas City. We were an 8-hour drive from both sides of the family, save for some precious folks still back on the West coast. Since we left our hearts behind in California, we thought it would be okay because we jump at any chance to hop on a plane and head back there. It’s hard to move lots, friends. Our stint in Kansas City didn’t last long (but was full of so much good barbecue). Just as we were getting settled in, we moved to St Louis. My husband is one of those people that is so warm, genuine and kind; he makes friends so easily. People sidle up to him quick and share their hearts. He’s just so open and trust-worthy. And you get a sense of it in the first few seconds of talking to him. I, on the other hand, can take a bit of warming up to (read: wine). Luckily, everywhere we’ve lived, we’ve become quick friends with our neighbors. Not only is being neighborly a good tradition to have, but I can’t tell you how nice it is to have best friends next door. I don’t have to schedule a lunch date, I just go over. I don’t have to call first to ask if anyone wants to open a bottle of wine on the porch, people just show up. It’s such a warm feeling. We all need more drop-by friends. Friends that you don’t have to clean the house for. Those are neighbor friends. The best kind of friends. We start out getting to know our neighbors by inviting them over for drinks and dessert (like this quarter sheet cake) on Friday nights. After a long work week, everyone looks forward to a cocktail and a little sugar. My husband handles the drinks, and I, of course, make the dessert. However, I need a little more than dessert for two, don’t I? I mean, sometimes a small batch of cupcakes that makes 4 is perfect, but I always like to send people home with extra for the kiddos. This tradition has served us well everywhere we’ve lived. We’ve made life-long friends with our neighbors in every state we’ve lived in. That is how I started scaling down the Pioneer Woman’s chocolate sheet cake. I certainly didn’t need a giant chocolate cake, but I needed one that served more than two. I halved her recipe and baked it on a quarter-sheet pan, made a few alterations, and it’s perfect! Everyone loves chocolate, and I get about 6 generous servings out of the pan. That’s enough for the 4 of us, plus if anyone wants seconds or an extra slice to take home for kids. This quarter sheet cake is the perfect size for celebrating small things, or having a few friends over. Everyone still gets chocolate cake, but you don’t have to make a giant 3-layer one. 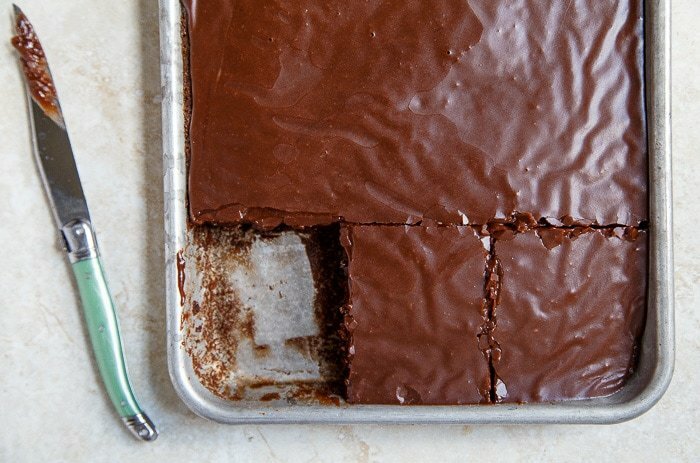 Plus, the cake to frosting ratio on Texas Chocolate Sheet Cake is ideal. 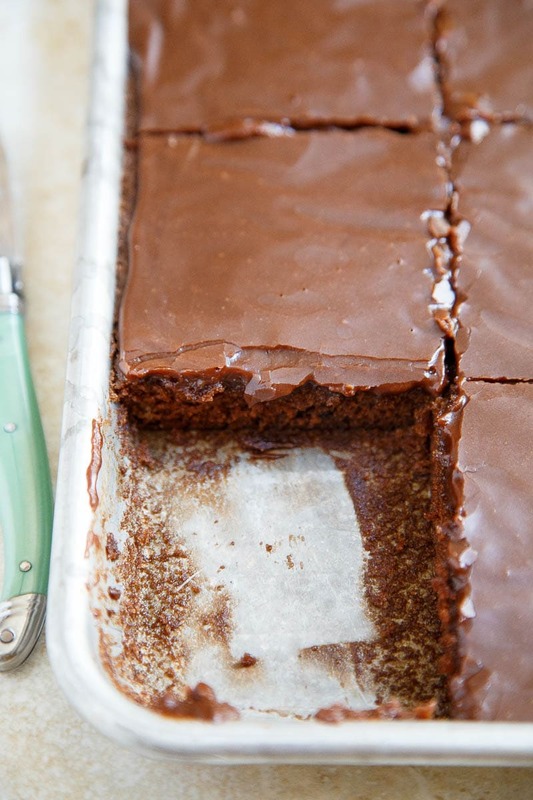 My quarter sheet cake pan measures 9×13″ with a heavy 1″ lip on the sides. 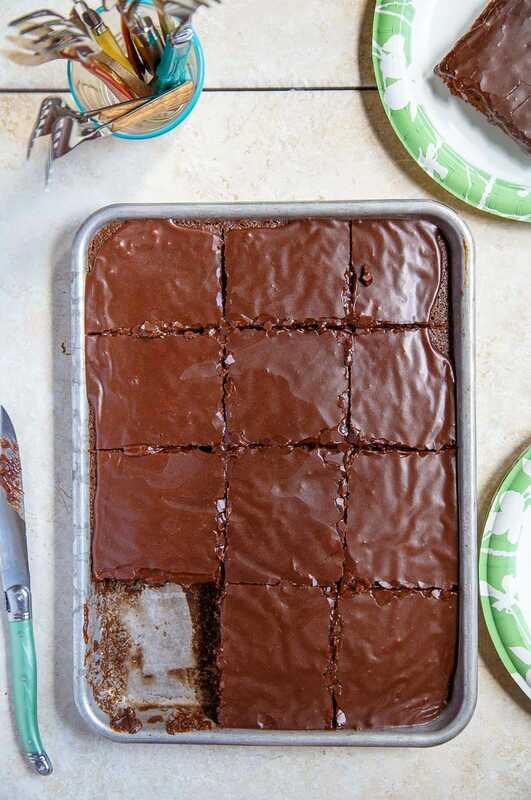 How many people does a quarter sheet cake feed? You can see in the photo that I got 12 small squares of cake, but I would say this quarter sheet cake generously serves 6 people. Our neighborly visits often go late, and I’m too tired to do dishes when everyone leaves, so I use paper plates. I think it provides a more casual feeling anyway. Last Friday, I used these pretty floral Dixie paper plates. Clean-up was a breeze, and they’re perfect for sending home leftovers, too. So, make it easy on yourself, grab the paper plates and invite your neighbors over! Make moments that matter together! I hope you love this Texas Chocolate Quarter Sheet Cake! This is the exact quarter sheet pan I use and love. Lightly spray a quarter-sheet pan with cooking spray. A quarter-sheet pan measures 12x10-inches. First, make the cake. In a medium bowl, whisk together the flour, sugar, and salt. Once melted, stir in the cocoa powder and boiling water. In a measuring cup, stir together the buttermilk, egg, baking soda and vanilla. Add the buttermilk mixture to the flour mixture, following by the boiling water mixture. Stir together all cake ingredients very ell, and then pour into the prepared pan. Bake cake for 15-18 minutes, or until a toothpick inserted comes out clean. While the cake bakes, make the frosting. In the same saucepan, melt the butter over medium-low heat. Stir in the cocoa powder, buttermilk and vanilla until well-combined. Remove the pan from heat and whisk in the powdered sugar. Immediately when the cake comes out of the oven, pour the frosting over. 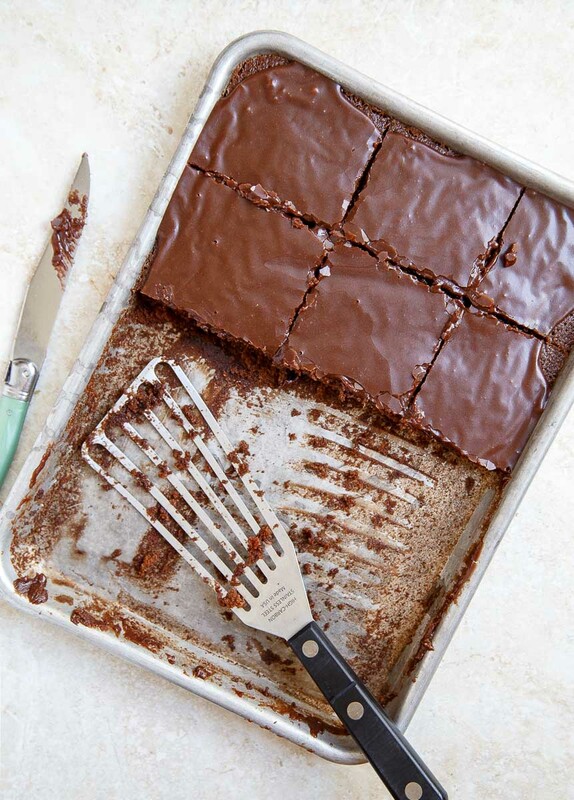 Use an off-set spatula to spread the frosting to the edges of the pan. Let the cake cool for at least 30 minutes before serving. I want to be your neighbor!! Don’t assume those people on the left that are your grandparents age aren’t up for cocktails!!! They just might surprise you???????? I always add a teaspoon of cinnamon to my batter. It changes the cake for the best. This looks AMAZING! I love anything chocolate! I haven’t made a sheet cake in ages. I always put frozen black cherries in mine, since I am too lazy to make a full blown black forest cake, and it was my husband’s favorite. Oh my word!! This would be so yummy!! Hey Christina, I, too have trouble warming up to new people due to inherent shyness, but have always found I open up when food is involved. Thanks for sharing your scaled down recipe and gorgeous photos. The Dixie plates are perfect:-) I love your “about me” video – fantastic! I know all to well about multiple moves! We have moved cross country 4 times and it is so hard. Love the idea of sharing this cake with new neighbors though – that would surely win them over. Perfect size for us two plus! Thank-you so much! When my grandkids pop in, and yep, they do now that one is driving!!! They expect something. I am hoping these could cut into serving sizes, wrap and freeze individually and would take just a few minutes to thaw on the counter while we visit? We moved 9 times from coast to coast (and the mid-west) in our first 12 years together. I feel your pain! And, yes, food is always a good “welcome wagon”. That’s so awesome that you make such good friends with your neighbors! I’m jealous! Neighbour friends are the best! We have just moved into our new home so we haven’t really made friends with our neighbours yet, but I’m hopeful! And I will totally be copying the cocktails and sweets equation when we do make friends. No wonder you are life long friends with your neighbors when you present them with desserts like this! 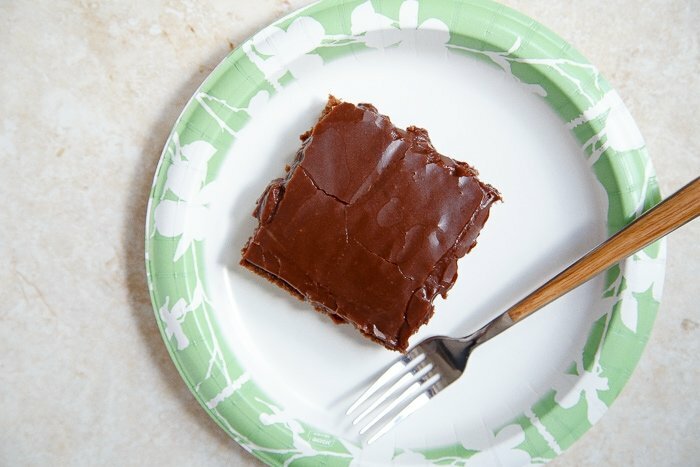 My family loves Texas Sheet Cake, great to see a version I can make for a small group. I didn’t realize we had so much in common. I went to college in Kansas (go Jayhawks), lived and worked in St. Louis for 5 years, then headed back home to Hawaii to be close to family, only to turn around and move to San Francisco for work. With the holiday’s coming up soon may I recommend checking out Main St. St.Charles during Christmas time. It would be fun to take your neighbors there eat, see the old fashioned carolers, and shop. I made this for my knitting group. It is delicious. Everyone loved it. We thought the idea of this cake serving 4-6 was hilarious. It’s so rich, it can easily serve 12. I have added it to my notebook of favorite desserts and I know I’ll make it often. This looks delicious! I like it. Thanks for sharing this recipe. I’m thinking this is going to be a life saver and dangerous! This is my daughter’s favorite cake but it’s too much to make for our family of five. Thanks for cutting it back in size. It will be perfect for my upcoming birthday with some homemade vanilla ice cream! Yum! Thanks. This was the perfect size! I read somewhere that you could sub yogurt for buttermilk. I used whole milk yogurt in the cake and frosting and it was REALLY great! Again thank you! cinnamon & coconut are a must; pecans that are chopped are an added bonus as well. Take it from me. I have made many and I am from TX. NO coconut! I have made many, too and I am also from Texas. Pecans in the icing is fine, and yes, cinnamon in the cake is great, but NO coconut! This has almost cooled on my counter! I am so glad that I stumbled upon your recipe. Being empty nesters, the standard size is way too much. I mean we COULD eat it all but we shouldn’t, right? My mom always baked goodies for the neighborhood everywhere we went. My dad was with the State Department so there were foreign countries too. We are moving soon to a whole new area of the country and I will definitely keep the tradition going! On Thursday, I baked two “Texas Sheet Cakes” for a church function. I was using the church kitchen, which is pretty fully stocked because a community meal is served there each Saturday. I was dismayed, though, to find that the kitchen had only gluten-free flour substitute and it was completely out of cocoa! I hate gluten-free cakes, and I was not very confident in my ability to substitute semi-sweet baking chocolate, so I was sure that my (Pioneer Woman) recipe was doomed. I had fun anyway, treating the situation as if it were a Cutthroat Kitchen experience. I had to sort of guess as to how to alter the butter and sugar in the recipe to compensate for the chocolate already having fat and sugar. And I tried to figure out what made the hideous texture in gluten free cakes, so I ended up adding extra eggs. Also…when I made the frosting, I found the chef had already locked the refrigerator back up, so I didn’t have any plain milk, all I had was the buttermilk I had used in the cake. Altogether, the cake was really not the original recipe at all. It looked great, but I wasn’t going to be able to taste it until it was served on Sunday, sooooooo…. I went home from the church and made another one the way it’s supposed to be made, and brought that with me Friday to a potluck at a different church. That turned out to be a hit, and the same people were gathering the next day again, so I went home and made the recipe again, this time leaving out the cocoa so that it was a White Texas Sheet Cake. That was also very well received. Sunday came and I finally got to try the Cutthroat Kitchen version…which somehow turned out to be the best of the three! I wanted to eat more and more and more of it, but alas, we were sharing with large groups, so I just had a tiny piece of all three versions. I have unexpected plans to have someone over tonight for dessert, and the memory of those four cakes is still very fresh in my mind, as is my longing for more of them. But it’s silly to make an entire Texas Sheet cake for two people. So I came to Desserts for Two for some other idea…and lo! and behold! I see that our dear Christine has had the exact same dilemma and solved it!!!! Here’s to my fifth Texas Sheet Cake in as many days! Can you use a 13×9 baking pan? It’s tricky…I think so. I haven’t personally tried it, but others seem to have used it successfully. I don’t know how the extra heat from the height of the pan affects the cake, though. I use it to make mini cake rolls in my book, too! We always use 13×9 pan to make his fabulous cake. And yessss add I teaspoon cinnamon to the flour. This old Texas gal has made this for years! This recipe is perfect for a small family. It is delicious! This cake is like eating an awesome chocolate candy bar… it’s addictive. EVERYTHING about it is wonderful. It baked perfectly, the frosting was a wonderful companion to the cake. The size was just right for the two of us. We had chocolate cake (and a little scoop of Hagen Daz pecan ice cream. They were wonderful companions! At another time I sent a review on the Texas Vanilla Sheet Cake — also a winner! Has anyone made this with some sort of egg substitute? Which type of egg substitute works best? How do u save the rest of it, should i refrigerate? Made this tonight—my first Texas sheet cake despite eight years living in Austin. Thank you for sharing the recipe. Yes, just a typo. Just 7 tablespoons of butter in the frosting. I used to make this cake when my kids lived at home, but love the smaller recipe. It’s snowing outside, so today was a great day for baking…. 4000 calories per serving? Really? No, not really. My nutrition calculator was just installed, and I’m going back through 800 recipes and updating it. I am from Pennsylvania and my Mom used to make this all the time! I never make it because it makes an entire sheet! Now I can make it and not have those left overs calling my name in the middle of the night! Thank you!